When you’re doing things like blogging about your products (or someone else’s), there’s going to be room in the sidebar area for you to put things. Some people put an opt in box there, links to their social networking profiles, or hyperlinked images to the products they sell. But don’t forget about using the space for ad revenue, too. Blogs in particular can be high traffic entities, so publishers and product owners love the idea of placing their ads on your blog. Most people know these are not personal endorsements by you. If anyone asks, just be honest and let them know that’s a paid ad spot. There are two methods you can use to fill the ad space in your blog – or static website – AdSense and Direct Sales. This is a very quick and easy way to get ads set up on your website. 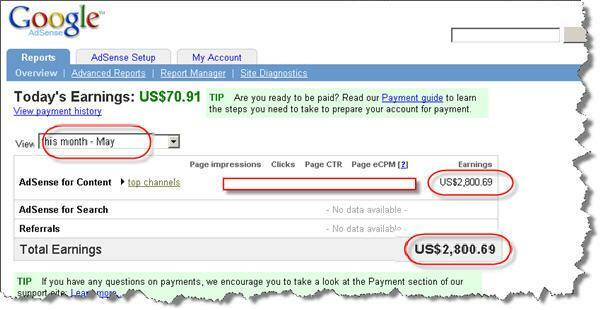 AdSense is a program owned by Google where product owners pay people like you have their ads on your site. You don’t get a flat fee, but rather earn money for every instance when a visitor on your blog clicks through to the product owner’s site. The money you earn depends on what the topic is. Some topics pay a lot of money per click (like insurance, for example). Others pay just a few cents – which can add up if you have a lot of targeted traffic. You have to be careful to follow all of the rules that companies set up for AdSense earnings. You can’t, for example, tell people to click on your link. That’s considered fraud! To get signed up, you’ll go to Google’s AdSense program and enter your domain and other info, such as what language your site is in. You’ll agree to some terms and then enter the method for which you want to get paid. You’ll get paid once a month – via check or direct deposit into your bank. You also have some semblance of control over what ads appear. For example, you can filter out certain competitive ads if there are companies you don’t want siphoning off your blog traffic. Once your account is approved by AdSense, you’ll be ready to place your first set of code on your site. · Choose what kind of ads you want – AdSense for content, search, RSS feeds, domains, mobile content, or applications. To put ads on your site, choose AdSense for content. · Choose the Ad unit – you have the option to ask for text only, image only, or a mix of the two or go with the Link unit, which is a series of hyperlinks placed on your site instead. · Choose which format you want. This indicates the size and position of your ad. Do you want a large horizontal banner or a small button? Something in between? A nice vertical box? Choose whichever size you want on this step. · Pick the color pallet that best matches your site. You want it to blend in nicely. Or, some marketers like it to stand out and be more noticeable. · Choose the font options you prefer. · Pick the corner styles (do you want the ads rounded on the corners, or square?). · Make a decision about what you want AdSense to do if there are zero relevant ads to run in that space. For example, you can have them show a blank space, show some other ads that aren’t from Google, or fill in the space with a solid color. · Next, add a channel with your domain name so that you can see where the clicks are coming from. This may not matter if you only have one site, but once your business grows into something with multiple domains, you’ll want to know if one site is outperforming all others in AdSense revenue. · On the last screen, click the Submit and Get Code button. The code you see there will be copied by you. · Go to your blog and log into your dashboard. · Drag a Text widget over to your sidebar (you can drag this around if you decide you want it placed somewhere else). · Paste the code you copied from AdSense into the text widget and save and then close the widget. · Check your site to see if there’s a block of space there. The ad won’t show just yet – you can come back later to see it once it’s gone live. But you should see a blank area. Never, ever, ever click on your own ads. And don’t ask others (your parents, cousins, and long lost friends) to do it, either. Google will ban your account in an instant and there’s almost no way to ever get it back.